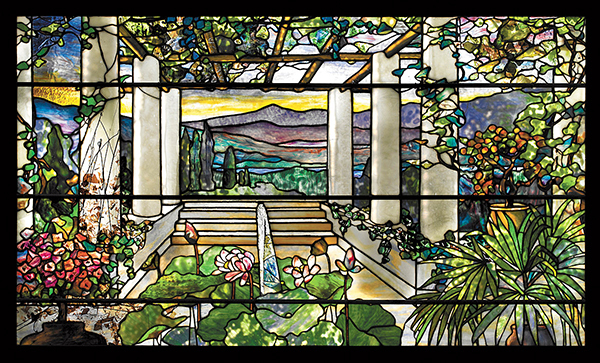 Through May 19, the Figge Art Museum is hosting the special exhibition Louis Comfort Tiffany: Treasures from the Driehaus Collection, a lavish overview of Tiffany’s mastery of color and form in a wide range of materials and decorative styles. Drawn from the collection of the Richard H. Driehaus Museum in Chicago, the exhibition features 62 exemplary works, spanning over 30 years of Tiffany’s prolific career. From small blown glass vases to breathtaking stained-glass windows and a spectacular selection of lamps, the exhibition demonstrates the craftsmanship and inventiveness of Tiffany Artisans. One of America’s most renowned artists, Louis Comfort Tiffany worked in nearly all the media available to artists and designers in the late nineteenth and early twentieth centuries—glass, ceramic, metalwork, jewelry and painting. Tiffany’s technical brilliance in a wide variety of media enabled him to convey his awe of the natural world through a range of objects, from common household items to one-of-a-kind masterpieces. His work was enthusiastically collected by art museums and private collectors throughout his lifetime and continues to be highly sought after today. Tiffany’s rise coincided with the emergence of the Aesthetic Movement in America. The phenomenon of Aestheticism considered “beauty” as a social and artistic force. The movement’s embrace of the decorative arts opened the doors to artists and craftsmen like Tiffany, who believed in enhancing the lives of their clients with beautifully designed rooms and furnishings. Although no one recognizable style typified the Aesthetic Movement, Tiffany’s work showed a preference for forms drawn from nature and the influence of art and design from Asia and North Africa. 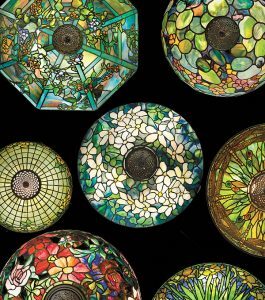 Louis Comfort Tiffany: Treasures from the Driehaus Collection is organized by the Richard H. Driehaus Museum and is toured by International Arts & Artists, Washington, DC. It is supported by The MacArthur Funds for Arts and Culture at The Richard H. Driehaus Foundation and sponsored locally by Arconic, US Bank, Xenotronics, MidAmerican Energy, Schafer Interiors, Cathy Weideman and John Gardner. Media sponsor: Quad-City Times. The Figge is open Tuesday through Saturday from 10 am to 5 pm, and Sunday from noon to 5 pm. On Thursday evenings, the museum is open from 5 to 9 pm with free admission. The Figge Café is open for lunch from 11 am to 2 pm Tuesday through Friday, and on Thursday evenings with a special appetizer menu. The first Thursday of each month is Free Senior Day, with exhibition tours and a free film, and special discounts for seniors in the Museum Store and Café. The Figge is located at 225 West 2nd Street in downtown Davenport. For more information, go to www.figgeartmuseum.org.